I Don’t Like Running. So Why the Heck Do I Do It? Some people love running. LOOOVE it. The endorphin kick, the runner’s high, feeling fleet and strong and free. These people look forward to running, have running shoes in the car just in case, and get disappointed when they can’t go for a run. I am not one of these people. For me, running is <grunt>. Aack. Bleah. Oof. Running is a hard slog. My Facebook timeline seems to tell a different story. Training runs. Event sign-ups. Running selfies. Victorious finish-line photos. Between what I post about running vs. how I feel about running, there’s a big disconnect. How can I train for and participate in all these running events if I really don’t like running? “Um…… <thinking> Not really.” I was stumped myself. How can this be? Why do I keep doing it? I’ve asked myself this question off and on for several years. This week, as I was proudly showing my newly-earned Hot Chocolate 15k hoodie, I was again asked, “Are you sure you don’t like running?” And I gave a new answer. Huh. That was different! All this time, I’ve been very conscious of what I don’t like about running. Running is hard. I get out of breath. Things hurt. I get blisters. If I don’t drink enough water the day before, man – I feel parched during a run. My digestion can get jostled around. No wonder I don’t like running! No wonder I don’t look forward to it. It’s good for me. OK, that’s not a new realization. I’ve always had this as a reason, but it felt like a “should”. But should or not, it’s a healthy activity. I don’t do much exercise otherwise. If I run properly with good form, I can do it and not get injured. It causes me to be intensely present with myself and my body. I’m constantly monitoring how I’m doing. Out of breath? Slow down. Something hurts? Shift. It’s absolutely hateful? Run for at least one mile (and then I can stop if I want). Being highly aware of my body and adjusting to take care of it seems like a really great practice. I actually do enjoy noticing improvement. We all have different measurements and definitions for improvement. I just needed to let go of fear of judgment and defensiveness around definitions that are different from mine. Among my running friends, I’m known for being strongly opposed to running a marathon or achieving a certain speed. I almost never say “I want to beat my time from last year.” But that doesn’t mean I don’t want to get better. Of course I care about my pace. I feel pride and embarrassment just like anyone. But my running goals are not a marathon or a PR. My running goals are: enjoy myself and don’t get injured. In terms of how my body’s doing, these goals are measured by: the run felt easy, I felt good and strong, and I didn’t get hurt. There are runs where I meet these goals! And that achievement feels so good! It’s fun to run in an organized event! I love that traffic is blocked off, or you get to run in a beautiful nature setting, and someone else has laid out the course. The energy of so many other runners around feels like a supportive embrace. It’s especially fun to sign up with friends, to give encouragement at the start and cheers at the end. And sometimes there’s really good event swag. Earlier this week, my dear husband said to me, “You do the running. But when you talk about running, it feels like you don’t have yourself. 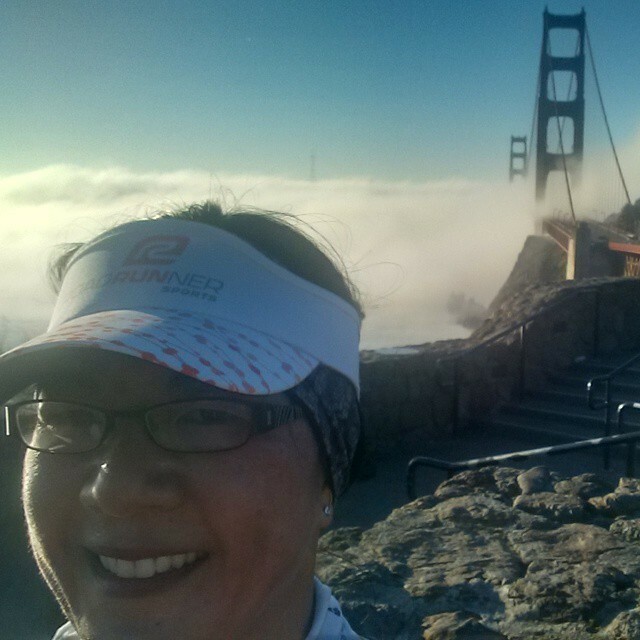 What reasons do you have for running that are just for you?” I loved that question. And I love that I’m finally seeing some answers about myself. Don’t worry. I still don’t love running. I’m still grouchy, fussy me. But maybe I really do like running more than I thought. This post is for the others of you out there who don’t love running, and who do it anyway. Fast or slow, enthusiastic or not – if you run, you are a runner. Rock on, fellow athletes!